This is not Guillermo Del-Toro’s Pacific Rim. The sequel to the widely-acclaimed action film by Del-Toro fails to rise up to its predecessor’s stature. 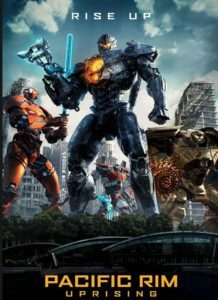 Featuring Steven S. DeKnight in his directorial debut, Pacific Rim: Uprising clocks in at 111 minutes of pure nonsense. In the Pacific Rim universe, war is waged between human kind and a group of aliens known as Kaiju. Kaiju are giant monsters that tower far above skyscrapers, harking back to monster movies of the past such as the Godzilla franchise. It translates into English as “Strange Beast” and has a long-standing history in Japan as the archetypal style of monster movie. The humans battle these beasts off with hulking robots called Jaegers. Jaegers require multiple people to pilot them through a process called “The Neural Handshake”, in which the minds of the drivers are linked together. While the original Pacific Rim payed great homage to the Japanese monster movie, DeKnight’s rendition feels like a sloppily thrown together caricature. With little to no plot holding together a coherent narrative, Uprising largely relies on its battle scenes to draw the audience in. So much of the narrative felt haphazardly thrown together in an attempt to give the fight scenes context. For example, there is a romantic subplot within the film that is only visited on about three occasions, none of which drive it forward. Ultimately, it is dropped without ever being concluded in a definitive way. This is the fate for many of the plot points in uprising. Traumas are unearthed, characters die, and fights are started without ever being revisited or even explained to begin with. It’s clear that far more effort was put into the fight scenes as well as the development of the various Kaiju and Jaegers than was ever given to the plot. However, this is where Uprising succeeds. If you’re seeking a movie where you can truly shut your brain off to the fullest extent and allow yourself to be driven by sheer commercialized insanity, look no further. The fight scenes are reminiscent of long days spent with childhood friends playing pretend, they are both absurd and gravely serious. The development put into the Jaegers is quite exciting, perhaps the most exciting thing about the film. There are so many moving parts and hidden weapons within them; it is dizzying to keep track of it all. The fight scenes are the most coherent thing about the whole film. They are well choreographed and feel fluid. But over all, Pacific Rim: Uprising was a letdown. Coming off the success of the original, which largely required no sequel, this film was not much more than a copycat attempt to profit off that first title. The biggest thing that Uprising left me wanting was LESS story. It made me ask myself, “Do I really need this broken context to enjoy this movie? Or would it have been better off as just two hours of fighting?” In the case of this film, I think such a statement is true. I give Pacific Rim: Uprising only 2 stars.